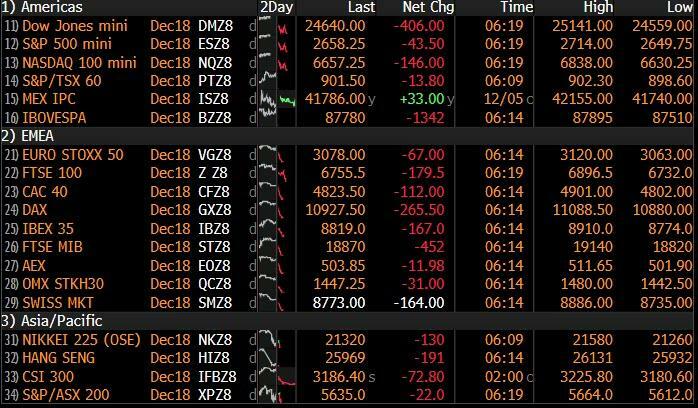 It is a sea of red out there as traders brace for China's response. ... after US markets were shut to commemorate the death of George H.W. Bush on Wednesday, global stock markets tumbled for a third day on Thursday as the arrest of the CFO of Chinese telecom giant Huawei in Canada for extradition to the United States prompted fears of fresh tensions between the two economic superpowers, and sparked dread as to how China would respond. 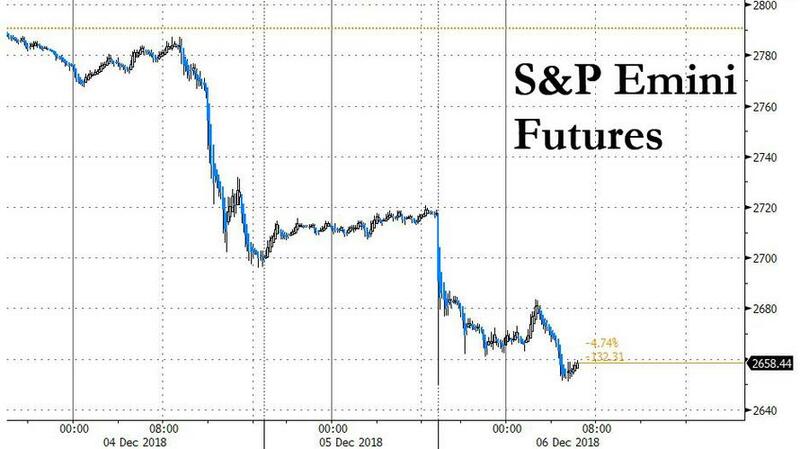 S&P futures by as much as 1.9% during the Asian session in a sudden and unexpected move that sent world equity markets reeling, and was trading near session lows, just above 2,650 this morning. The yuan dropped the most since October. The Bloomberg dollar index spiked amid safe-haven flows, rising just shy of 2018 highs. News of the arrest of Huawei’s CFO Meng Wanzhou, the daughter of the firm’s founder, who was detained by Canadian police on the same day Trump and Xi held their dinner in Buenos Aires, triggered renewed fireworks coming just as Washington and Beijing prepare for crucial trade negotiations and threatened to reignite U.S.-China tensions. The yuan dropped the most since October. Asian markets took a beating. Huawei is not listed but China’s second-largest telecom equipment maker ZTE Corp sank 9% in Hong Kong while most of the nearby national bourses lost at least 2 percent. Japan’s Nikkei shed 1.9%, closing at its lowest level since Oct. 30, with semi-conductor related shares leading the losses. MSCI’s ex-Japan Asia-Pacific index lost 2.0%; Hong Kong’s Hang Seng dropped 2.5% while Chinese bluechips lost 2.1% to take their 2018 slump to 20%. Europe slumped too in early trading as 3 percent falls for the tech sector, miners and also carmakers kicked London, Frankfurt and Paris to two-year lows. And while Hardy said that President Trump may try to send some reassuring tweets later, for now traders are not taking any chances with S&P 500 futures near session lows, down almost 2 percent, and over 5% in the past two trading days after Tuesday's 3.2% plunge. The losses would have been even steeper had CME Group’s Chicago Mercantile Exchange not implemented a series of 10-second trading halts in Asia that had limited the initial drop. Not helping sentiment, overnight BOJ Governor Haruhiko Kuroda said economic risks from abroad could be severe, and the Federal Reserve’s Beige Book report showed fading optimism over growth prospects at U.S. firms citing growing instances of economic "slowdown". 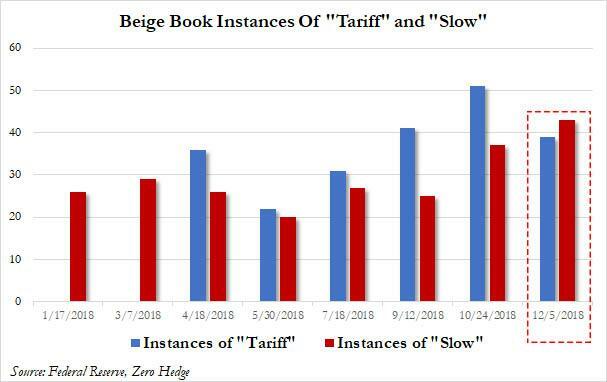 The plunge persisted even though a Chinese government spokesman said that China and the U.S. have reached agreement in the sectors of agriculture, autos, and energy, and China will immediately start implementing that consensus. Still, there’s no official, confirmed statement of what China agreed as part of the deal. "China will start from agricultural products, autos and energy to immediately implement specific items that China and the U.S. have agreed upon," Ministry of Commerce Spokesman Gao Feng told reporters in Beijing. "In the next 90 days we will work in accordance with the clear timetable and road map to negotiate in areas where both sides have an interest and there are mutual benefits, such as intellectual property rights protection, technology cooperation, market access, and the trade balance." That reassurance however faded in light of the shocking arrest, and the yuan eased 0.3% to 6.8835 per dollar in offshore trade. China’s foreign ministry said neither Canada and the United States had clarified their reason for the move but a source had earlier told Reuters it was related to violations of U.S. sanctions on Iran. The arrest again heightened the sense of a major collision between the world’s two largest economic powers not just over tariffs but also over technological hegemony. Britain’s BT Group said it was removing Huawei’s equipment from the core of its existing 3G and 4G mobile operations. Australia and New Zealand have also rejected Huawei’s products. “The U.S. has been telling its allies not to use Huawei products for security reasons and is likely to continue to put pressure on its allies,” said Norihiro Fujito, chief investment strategist at Mitsubishi UFJ Morgan Stanley Securities. "So while there was a brief moment of optimism after the weekend U.S.-China talks but the reality is, it won’t be that easy." Meanwhile, half way around the word, traders were also on pins and needles waiting to hear from the OPEC+ meeting in Vienna about what kind of cuts OPEC and other oil producers like Russia could make to their output. And in the latest price shock, WTI plunged almost 5% just above $50 a barrel as Saudi Arabia’s energy minister said going into the day long meeting that 1 million “would be enough”; with consensus among analysts for somewhere between 1-1.3 million barrels per day, this led to a quick waterfall in oil prices. At the same time, and adding to worries about U.S. recession risks, the Treasury yield curve remained inverted between two- and five-year zones; the 10Y yield dropped as low as 2.87% overnight - a 3 month low - amid a flood to safety. Yields on German 10Y bunds held near six-month lows in risk off environment. The Bloomberg Dollar Spot Index headed for a third day of gains as part of the global flight to safety. The yen led gains in G-10 as havens were supported. Elsewhere in FX, the euro barely budged at $1.1338 and the Canadian dollar languished near the 18-month low it had hit the previous day after cautious noises from the Bank of Canada. The pound drifted as U.K. Prime Minister Theresa May searched for a compromise to avoid a crushing defeat on her Brexit deal in a key vote in Parliament next week. In the latest Brexit news, UK PM May was being pushed by cabinet members to postpone next week's Parliament vote on Brexit amid worries she is facing a loss so disastrous it could collapse the government. Instead, cabinet members believe that the PM should devote more time to selling the deal. Furthermore, reports have suggested that PM May has sent her Chief Whip to try find a way forward with the ERG by offering a potential Parliamentary ‘lock’ which would require lawmakers to give their consent before some of the more controversial parts of the UK’s exit from the EU came into effect. U.S. jobs data is due on Friday. If the figures show any sign of serious weakness, markets are likely to react HSBC’s head of macro economic strategy, Shuji Shirota, said. Asian stocks were lower across the board for a 3rd consecutive day with sentiment dampened after the US market closure and reports that Canada arrested Huawei’s CFO at the request of US authorities for alleged violations of sanctions against Iran. This prompted demands by China’s Embassy for an immediate release of the executive and led to concerns of the potential ramifications to trade discussions which weighed heavily on US equity futures. As such, Emini S&P declined by over 60 points and DJIA futures were down by more than 500 points shortly after the reopen which forced the CME to intervene to prevent a harder drop, while ASX 200 (-0.2%) and Nikkei 225 (-1.9%) were also weaker with the latter pressured by detrimental currency flows. Hang Seng (-2.5%) and Shanghai Comp. (-1.6%) conformed to the negativity with the Hong Kong benchmark underperforming amid losses across all its components and as local money markets rates edged higher again, while the PBoC announcement of a 1-yr Medium-term Lending Facility failed to support China with the operation at a reduced amount of CNY 187.5bln vs. Prev. CNY 403.5bln. Finally, 10yr JGBs were higher amid a continuation of the declines across yields and with safe-haven demand also underpinned by the weakness across equities. European equities (Eurostoxx -2.0%) have taken the lead from US futures and Asia-Pac trade overnight with US-Chinese trade concerns reignited by news that Canada arrested Huawei’s CFO at the request of US authorities for alleged violations of sanctions against Iran. This prompted demands by China’s Embassy for an immediate release of the executive, which subsequently weighed heavily on US equity futures. Despite commentary from China ahead of the open stating that their ultimate goal in US-China negotiations is to remove all tariffs, overnight developments have weighed heavily on sentiment in Europe thus far. The follow-through of events overnight has placed weight on IT names with STMicroelectronics (a supplier to Huawei) lower by -4.8% with losses also observed in Dialog Semiconductor (-2.6%) and Infineon (-3.3%) among others . Elsewhere, energy names underperform amid initial comments from the OPEC ministers in Vienna, signalling a potential cut in the low end of the expected range. In turn, European Oil and Gas Index fell 3.4% in-fitting with price action in the oil complex (BP -4.3%, Total -2.5%). In FX, JPY/USD/CHF - All beneficiaries of safe-haven positioning/demand, as the global stock rout continues and intensifies, but to varying degrees with Usd/Jpy retreating below 113.00 while Usd/Chf holds near parity and the DXY remains around 97.000 amidst heavy losses in certain G10 counterparts. However, some hefty and layered option expiries in Usd/Jpy could keep that pair in check, with 1.6 bn rolling off between 112.75-80 and a similar amount sitting at 112.95-113.00, ahead of more 1+ bn maturities above the figure up to 113.75. AUD/CAD/NZD - The non-US Dollars have extended declines vs the Greenback and underperformance against other majors, as bearish independent impulses exacerbate the negative impact of broader risk aversion. Aud/Usd is now testing 0.7200 bids and psychological support following dovish commentary from RBA’s Debelle in wake of this week’s disappointing GDP data, with rate cuts back on the agenda if the economy slows further and the baseline scenario of the next policy move being a hike does not pan out. By the same token, and with the added pressure of collapsing crude prices amidst talk of no more than 1 mn output cuts from OPEC+, the Loonie has continued its post-BoC plunge to circa 1.3440, while the Kiwi has slipped below 0.6900 towards 0.6850, but is deriving underlying support from the greater demise in the Aud again, as the cross retreats through 1.0500 and to a fresh ytd low around 1.0480. GBP/EUR - The Pound and single currency are both holding up reasonably well given the increasingly risk-off environment, not to mention ongoing Brexit and Italian budget tension, as Cable maintains 1.2700+ status and Eur/Usd stays above 1.1300. Note, mega option expiries in close proximity from 1.1295-1.1300, 113.50-60 to 1.1380 (1.65 bn, 1.7 bn and circa 1.4 bn respectively). In commodities, Brent (-4.3%) and WTI (-4.2%) have continued to drift lower as the 175th OPEC meeting begins, with initial remarks from OPEC delegates suggesting that OPEC+ could only cut 1mln BPD if Russia agrees to cut 150k BPD, adding they would be willing to cut over 1.3mln BPD if Russia cuts 250k BPD. Sources thereafter went on to state that any cut is unlikely to be over 1.4mln BPD. Russia’s role in the agreement continues to remain a source of speculation with prices hampered by comments from the Russian Energy Minister Novak suggesting that it is difficult for Russia to cut output quickly in Winter. WTI and Brent crude futures were then dragged lower once again after the Saudi Energy Minister Al-Falih says there is no agreement yet to cut but all options are on the table, including a no deal. Al-Falih then added that a 1mln BPD cut will be enough for OPEC+, a comment which appeared to add to the downside in energy markets with the level touted not well received by the market, particularly after he then went on to state that the KSA are content with the current oil price. Furthermore, questions also remain over who might not participate in any output cut with NOC's Sanallah contradicting comments from the Oman oil minister overnight after stating that Libya is hoping for an exemption from the OPEC cuts. Additionally, Iran continues to hold a tough stance in negotiations by stating that they will not be a part of any deal to reduce output until sanctions are removed. Note, this week’s DoE report will be released today due to yesterday’s market closure. Gold is trading flat within a tight USD 5/oz range, with spot palladium trading at a premium to gold for the first time in 16 years; as prices hit record levels of USD 1246.50 in the previous session. Separately, China has reportedly asked steel mills in the province of Tangshan to being implementing winter curbs due to a reduction in air quality. Any hope that a break in US trading yesterday might alleviate the risk-off which has spread back through markets since Tuesday appears to be lost with heavy falls across Asia again overnight.The Nikkei (-2.45%) and Hang Seng (-2.75%) have slumped the most however not far behind is the Shanghai Comp (-1.65%) and Kospi (-1.57%). S&P 500 futures are also down -1.23% while EM FX is also lower across the board. These moves have come as the Treasury curve has flattened once more with 2s10s flattening another 1.4bps to 10.7bps at the time of going to print. That’s not quite the 9.2bps intraday low on Tuesday but its within touching distance again. The 2s5s (-1.8bps) and 3s5s (-2.0bps) curves have extended their moves the into negative territory. Also not helping this morning is news (per Bloomberg) that Canadian authorities have arrested Huawei’s CFO – and daughter of Huawei’s founder - at the request of the US government for alleged violations of Iranian sanctions.The Chinese embassy in Canada has called on Canada and the US to “rectify wrongdoings” and clearly this has come at an important and fragile stage of US-China trade talks. Our Chief China Economist Zhiwei Zhang believes ( link ) that this news has lowered the probability of the US and China reaching a trade deal by March to 30% from 40%. He notes that public opinion in China will likely become more negative in respect to the trade war, and potentially against US companies. The government may find it difficult to tell the public that they have offered significant concessions to the US. So an important development and one to watch as the day plays out. The moves this morning come after the STOXX 600, DAX and CAC closed -1.16%, -1.19% and -1.36% respectively yesterday in what was actually a mostly sideways session following an initial plunge at the open. Sentiment was given a boost by President Trump tweeting that China was sending “very strong signals” following the weekend trade discussions, although it’s hard to really know what to believe with these headlines at the moment. A reminder that this came after China’s Ministry of Commerce broke the silence and released a statement saying that China was pushing ahead on trade negotiations within the 90-day “timetable and road map” while Bloomberg also reported that China had begun preparations to restart imports of US soybeans and LNG. Meanwhile, WTI oil is -1.02% overnight going into a potentially important juncture for the oil market with the two-day OPEC/OPEC+ meeting beginning in Vienna today (OPEC will meet today and OPEC+ on Friday).Yesterday, DB’s Michal Hsueh published a preview note ( link ) of what to expect. Michael notes that the 1.5 mmb/d deterioration in the market balance for oil this year serves as a handy benchmark by which to judge the adequacy of any supply reductions agreed this week. Given the ambiguity involved in describing cuts in relation to the existing quota, any genuine effort to rebalance the market will involve a specified reduction in volume, rather than percentage compliance. Another important benchmark is the OPEC Economic Commission Board which recently estimated the necessary cut to balance the market at 1.3 mmb/d. Ultimately Michael believes that there are 3 scenarios for this week; (1) Reaffirmation of a commitment to 100% compliance with Algiers Accord quotas – which would be equivalent to a ‘no-deal’ outcome. (2) A cut meaningfully less than 1.5 mmb/ d (highest likelihood), which could be formulated as a return to May 2018 production levels. (3) A cut greater than or equal to 1.5 mmb/d – a relatively unlikely scenario. We may have already been given a big hint as to what to expect with headlines yesterday pre-empting a cut. The oil minister for Oman said that OPEC+ has a consensus for a cut beginning January for six months following a meeting between OPEC+, Saudi Arabia and Russia. That sent WTI oil up as much as +1.95% however the move was quickly wiped out after the same oil minister added that the size of the cut could be just 1 mmb/d – an underwhelming number given Michael’s analysis above. Also weighing on sentiment, President Trump tweeted his hope that OPEC will not take action to increase prices. 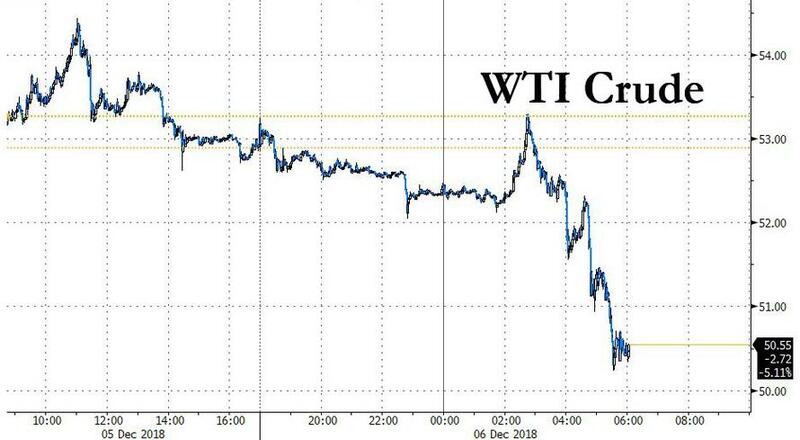 WTI eventually closed -0.68% last night. In other markets yesterday, Italy was the standout performer with the FTSE MIB only falling -0.13%, Italian Banks rallying +0.94% and 2y and 10y BTP yields falling 6.9bps and 9.5bps respectively. Reuters reported yesterday afternoon that the Italian Government is planning to send a revised version of the budget to Brussels by next week. This came after Italy’s Deputy PM Di Maio said that the Government wants to avoid disciplinary action with the EU which was notable in light of Di Maio being the most hawkish with regards to the deficit. Deputy PM Salvini is due to hold a press conference this morning so perhaps one to watch. Also helping Italy was a Reuters story yesterday suggesting that ECB policymakers are in the early stages of debate about possible multi-year loans and staggered increases in rates to help support the transition of the Eurozone away from monetary stimulus.The article emphasized that talks were at an early stage and was unlikely to feature at next week’s ECB meeting, however it’s not the first time that we’ve seen a mention of a new TLTRO. The prospect of the new loans being permanent is hawkish for rates, since it could be viewed as providing an offset that clears the way for an earlier rate hike. There was a fairly modest reaction from other European bond markets to that story, with Bunds eventually climbing +1.5bps by the end of play to 0.274%. They did however hit as low as 0.2397% intraday which eclipsed the closing low from back in May. You have to go back to June 2017 to find the last time Bunds closed that low. It’s fairly amazing that Bunds up until the 7y maturity still trade with a negative yield and that $7.6tn of global debt still trades with a negative yield. Believe it or not that number had fallen to ‘just’ $5.7tn in October. As for other snippets yesterday, the final November PMIs were out in Europe. There was better news to come out of Italy where the services print came in 1pt higher than expected at 50.3 – a jump of 1.1pts from October. That’s unlikely to allay concerns of another negative Q4 GDP print in Italy however, especially with the composite at 49.3 and unchanged versus October due to the big decline in the manufacturing print. For the broader Eurozone the composite edged up 0.3pts to 52.7 from the flash reading however that is still down 0.4pts from October and the third consecutive monthly decline. France’s composite was revised up 0.2pts to 54.2 while Germany was revised up 0.1pts to 52.3. The big disappointment however was the UK where the services reading plummeted 1.8pts to 50.4 (vs. 52.5 expected), resulting in the composite falling to 50.7 and the lowest since the flash crash 47.6 reading in July 2016 immediately following the Brexit vote. That’s consistent with GDP growth of around +0.1% qoq. In fairness, market pricing for the next BoE hike has been pushed out, with February next year virtually completely priced out. Sterling (+0.12%) had to contend with that data and the latest Brexit newsflow. The government released the full legal assessment of Prime Minister May’s Withdrawal Agreement, which confirmed that the backstop arrangement would be very difficult for the UK to exit. The legal document also said that the EU could theoretically exclude the rest of the UK from the backstop while keeping Northern Ireland inside it, which is likely to be a dealbreaker for the DUP. This is damaging for May, but we already knew that her plan is unlikely to pass through parliament, so attention will continue to focus what comes next. With the unfavourable outcome for the DUP, the odds of a new election have risen, though the odds of parliament unifying around a market-positive deal have also risen. To the day ahead now, where the highlight is likely to be the aforementioned two-day OPEC/OPEC+ meeting in Vienna. Aside from that, this morning in Germany we get October factory orders data before a busy session in the US kicks off with the November ADP employment change print, October trade balance, Q3 nonfarm productivity and unit labour costs data, initial jobless claims, final November PMIs, ISM non-manufacturing report for November, and factory orders, durable and capital goods orders data for October. On top of that we’ve got the Fed’s Bostic speaking on the US economic outlook late this afternoon in Georgia, Williams holding a discussion with Mervyn King in New York and Fed Chair Powell making welcome remarks at a housing conference late this evening. The ECB’s Guindos is also due to speak, while the BoE’s Ramsden is slated to also make remarks.